If you’re in a hurry, why not let Halal Market do the hard work? 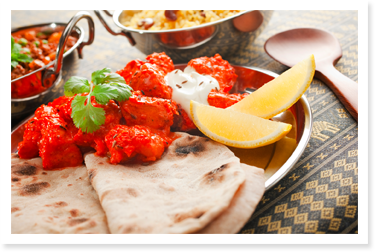 Our prepared chicken breast is ready to use, chopped or whole, and is the perfect ingredient for curries, kebabs or pasta bakes. 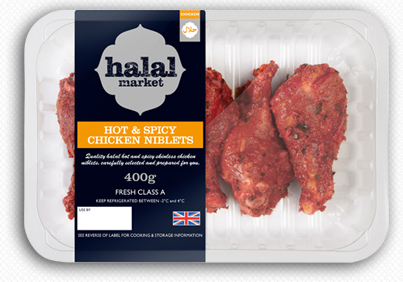 With ready-spiced and marinated portions too, there are endless ways to use Halal Market’s variety of wholesome chicken. 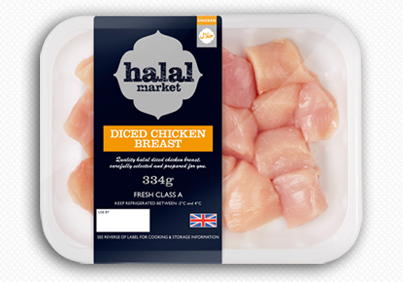 British Halal Chicken Breast (93%), Spices, Dextrose, Modified Maize Starch, Maltodextrin, Tomato Powder, Cornflour, Salt, Garlic Powder, Onion Powder, Colouring (Paprika Extract), Parsley. 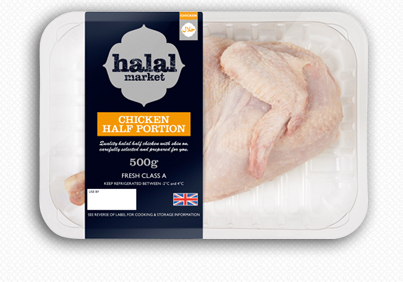 British Halal Chicken (90%), Tandoori Masala (Garlic, Ginger, Green Chillies, Salt, White Vinegar, White Cumin Powder, Garam Masala, Black Pepper, Mint Leaves, Aniseed, Black Cumin, Green Cardamom, Black Cardamom, Fenugreek Leaves, Red Chilli, Paprika, Lemon Juice, Vegetable Oil). ALLERGY WARNING This product may contain traces of Celery, Mustard and Soya. There are so many dishes to look forward to when you buy fresh Halal Market Lamb. Available in a variety of cuts and styles, our diced Lamb makes for a fantastic spicy skewer. Ready-prepared meatballs are a great accompaniment to couscous or Italian tomato sauce. Imagine our Lamb Sausages grilled on a fiery barbecue. Delicious! 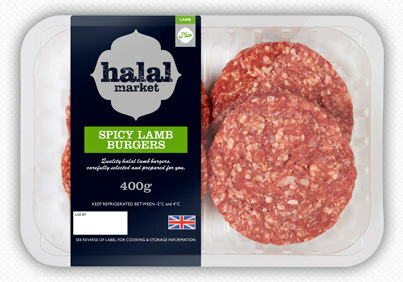 British Halal Lamb Mince 80VL (92%), Seasoning (8.0%) (Salt, Black Pepper, Spices & Herbs (Celery, Mustard Flour), Onion Powder, Dextrose, Flavour Enhancer (Monosodium Glutamate), Preservative (Sodium Bisulphite). ALLERGY WARNING This product contains Celery, Mustard and Sulphites. 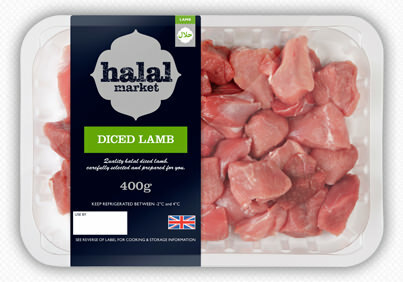 British Halal Lamb Mince 80VL (80%), Seasoning (10%) [(Breadcrumb (Wheat Flour, Salt, Yeast), Rusk (Wheat Flour, Salt), Salt, Dextrose, Onion Powder, Stabiliser (Diphosphates), Preservative (Sodium Metabisulphite), Hydrolysed Vegetable Protein (Soya, Salt, Maize Gluten, Acidity Regulator (Citric Acid), Colour (Caramel), Spice Extracts, Antioxidants (Sodium Ascorbate, Sodium Citrates), Herb Extracts, Onion Extract)], Sheep Casing. ALLERGY WARNING This product contains Wheat, Gluten, Soya and Sulphites. 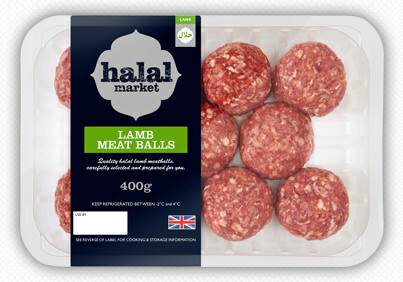 British Halal Lamb Mince (80%), Seasoning (20%) [(Salt, Black Pepper, Spices & Herbs (Celery, Mustard Flour), Onion Powder, Dextrose, Flavour Enhancer (Monosodium Glutamate), Preservative (Sodium Bisulphite)]. Enhance your recipes with large, strong and juicy Mutton cuts. Hearty, rich and tender, there couldn’t be a better choice for all your pies, puddings, pot roasts, spicy Middle Eastern dishes or curries. 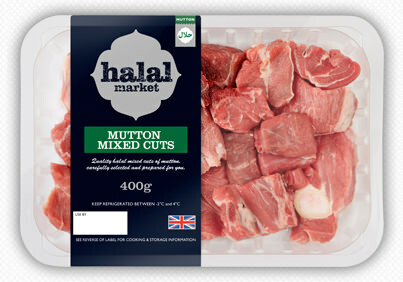 Our Mutton brings a truly authentic flavour to any traditional or modern dish. Succulent and deliciously satisfying, these burgers and sausages have a hot & spicy kick, making them a mouth-watering choice for parties or an evening treat for all the family. 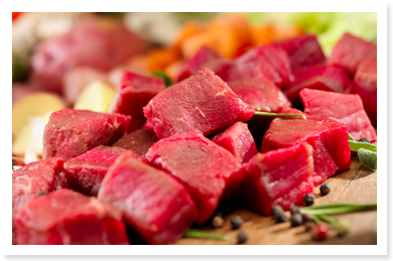 Just like all the meat in the Halal Market range, the beef you’ll find in these products is 100% pure British. 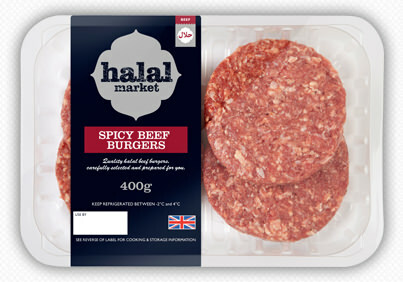 British Halal Beef Mince 80VL (92%), Seasoning (8.0%) [(Salt, Black Pepper, Spices & Herbs (Celery, Mustard Flour), Onion Powder, Dextrose, Flavour Enhancer (Monosodium Glutamate), Preservative (Sodium Bisulphite)]. ALLERGY WARNING Contains Celery, Mustard and Sulphites. British Halal Beef Mince 80VL (80%), Seasoning (10%) [(Breadcrumb (Wheat Flour, Salt, Yeast), Rusk (Wheat Flour, Salt), Salt, Dextrose, Onion Powder, Stabilisers (Diphosphates), Preservative (Sodium Metabisulphite), Hydrolysed Vegetable Protein (Soya, Salt, Maize Gluten, Acidity Regulator (Citric Acid), Colour (Caramel), Spice Extracts, Antioxidants (Sodium Ascorbate, Sodium Citrates), Herb Extracts, Onion Extract)], Sheep Casing. ALLERGY WARNING Contains Wheat Gluten, Soya and Sulphites. Our fresh, golden, Marinated Basa fillet is an ideal, tasty alternative when you’re in the mood for this classic dish, but just can’t dedicate enough time to preparing it. Seasoned with Lemon juice, crushed chilli and garlic, all you need to do is grill or fry, and then enjoy! Basa Fillet (Pangasius bocourti) (90%), Seasoning (10%) (Lemon Juice, Vegetable Oil, Salt, Chilli Powder, Cumin Powder, Crushed Chilli, Carom Seeds, Fresh Garlic). ALLERGY ADVICE May contain traces of Celery, Egg, Milk, Mustard and Soya. Each step of the way, our experts ensure that every delicious product in our range is worthy of the Halal Market brand. We’re passionate about creating truly authentic products that you and your family will be happy to buy and enjoy time and time again. 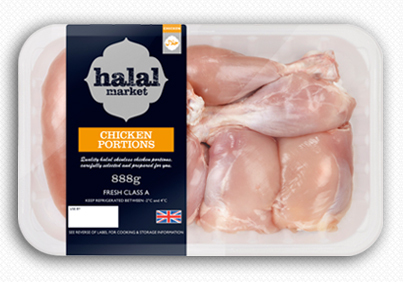 We’re proud to say that all our Halal meat is sourced from qualified and appropriate suppliers. 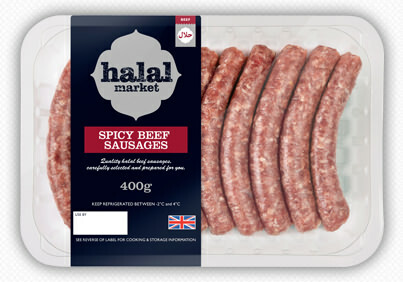 No unwelcome ingredients, just great tasting, 100% British meat across the whole Halal Market range. We like to think our Red Tractor approved chicken is a great example of our dedication towards meat of the highest standard. We have a duty to make our products and run our business in a responsible way. 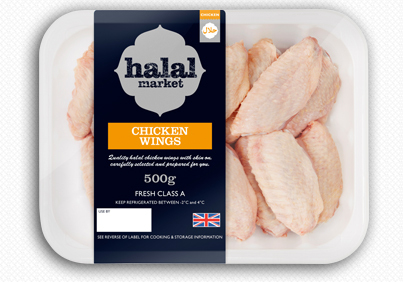 That’s why we’ve teamed up with leading suppliers, who have years of experience providing halal products of the highest quality. 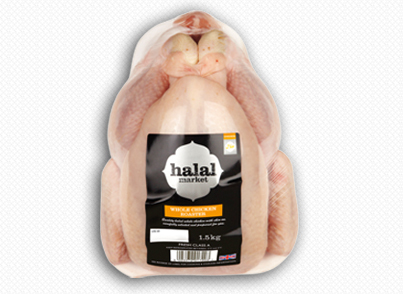 Each of our foods are carefully selected by our specialist suppliers, such as Highbury Poultry www.highbury-poultry.com a 100% Halal processing site in Shropshire. As you would expect, our suppliers take animal welfare seriously. They are Red Tractor certified, and are accredited by various organisations that assure customers of their continued commitment to 100% natural and healthy food. Visit our suppliers’ websites to find out more. How do you know that the source of the meat is halal? We have thoroughly checked, and continue to make regular checks, that all stages of production from source to shelf are guaranteed halal. You can be sure that we will take all steps to ensure the continued quality of our halal products from our handpicked sites to our bespoke herbs and spices. We source our chicken from Highbury Poultry www.highbury-poultry.co.uk and Freemans of Newent www.freemansofnewent.co.uk Both have very high standards of halal testing and quality assurance. What procedures do you have in place to ensure the quality of the meat? All our suppliers, make regular checks to ensure their continued high standards and we ensure regular audits are conducted to ensure we are getting the best quality products for our customers. We source all our poultry from Highbury Poutlry, to find out more about their testing procedures, you can visit them online via the above addresses. How fresh is the meat? All our halal meat comes from local sources - smallholders and farmers who share our beliefs in providing good quality, fresh Halal meat. How do I know if I'm eating meat that has not come into contact with Non-halal meats? 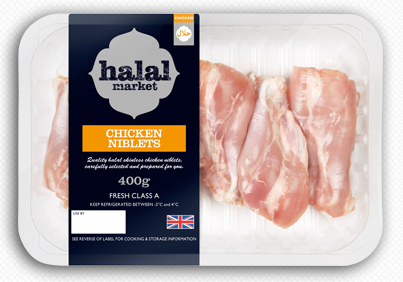 It is vital that we do everything we can to ensure no contact is made between halal and non-halal meats. 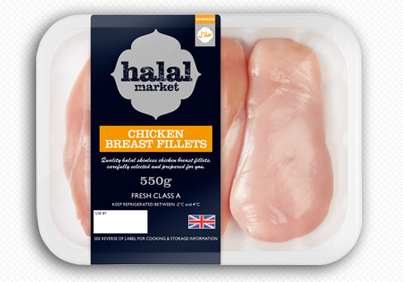 No non-halal meat is prepared with halal meat, and the working environment is cleansed thoroughly to ensure hygiene levels are of an exemplary standard. Who has certified you as halal? 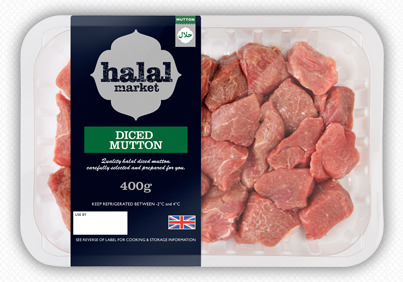 We understand how important it is to our customers to ensure that the meat is halal. 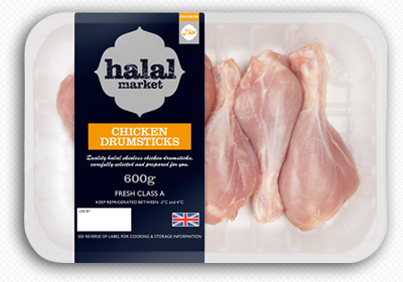 As experts in Halal products, we carry out strict procedures that guarantee our meat is halal. If you would like to find out more, feel free to get in contact with us at or contact our suppliers directly via the websites above. Are the animals treated ethically? Welfare is of utmost importance to us at Halal Market. 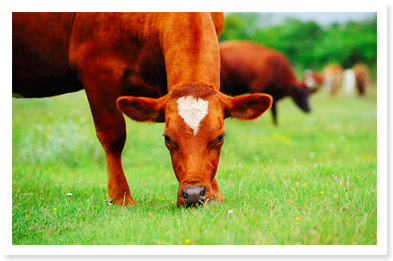 Healthier, happier animals mean we can provide meat of a superior quality. Regular checks are made on the treatment of our meat and fish in all parts of the supply chain, to ensure they are given a healthy diet and good living conditions. 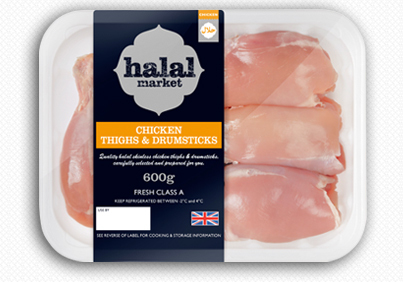 The entire range of Halal Market products are now available in the fresh meat and poultry aisle. Look at our locations list to find out which store is nearest to you. Can’t see your local store? 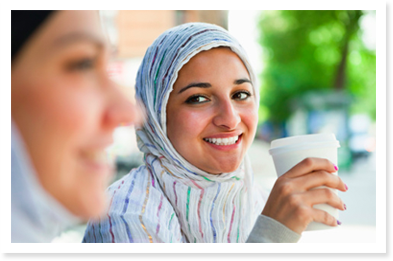 We want to introduce great halal food to more places across the country. 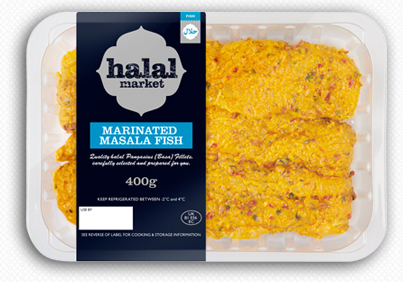 Tell us via email and we’ll do our best to bring Halal Market to a store near you. BACKGROUND: This agreement applies as between you, the User of this Web Site and Halal Market, the owner(s) of this Web Site. Your agreement to comply with and be bound by these terms and conditions is deemed to occur upon your first use of the Web Site. If you do not agree to be bound by these terms and conditions, you should stop using the Web Site immediately. "Web Site" means the website that you are currently using (www.halalmarketfoods.com) and any sub-domains of this site (e.g. subdomain.halalmarketfoods.com) unless expressly excluded by their own terms and conditions. 2.1 Subject to the exceptions in Clause 3 of these Terms and Conditions, all Content included on the Web Site, unless uploaded by Users, including, but not limited to, text, graphics, logos, icons, images,sound clips, video clips, data compilations, page layout, underlying code and software is the property of Halal Market, or our affiliates. By continuing to use the Web Site you acknowledge that such material is protected by applicable United Kingdom and International intellectual property and other laws. 3. Third Party Intellectual Property Where expressly indicated, certain Content and the Intellectual Property Rights subsisting therein belongs to other parties. This Content, unless expressly stated to be so, is not covered by any permission granted by Clause 2 of these Terms and Conditions to use Content from the Web Site. The exceptions in Clause 4 continue to apply. Any such Content will be accompanied by a notice providing the contact details of the owner and any separate use policy that may be relevant. 4. Fair Use of Intellectual Property Material from the Web Site may be re-used without written permission where any of the exceptions detailed in Chapter III of the Copyright Designs and Patents Act 1988 apply. 5. Links to Other Web Sites This Web Site may contain links to other sites. Unless expressly stated, these sites are not under the control of Halal Market or that of our affiliates. We assume no responsibility for the content of such web sites and disclaim liability for any and all forms of loss or damage arising out of the use of them. The inclusion of a link to another site on this Web Site does not imply any endorsement of the sites themselves or of those in control of them. 6. Links to this Web Site Those wishing to place a link to this Web Site on other sites may do so only to the home page of the site www.halalmarketfoods.com without prior permission. Deep linking (i.e. links to specific pages within the site) requires the express permission of Halal Market. To find out more please contact us by email at getintouch@halalmarketfoods.com or by post: 35 Park Square North, Leeds, LS1 2NY. 7.1.9 You must not use our System for unauthorised mass-communication such as "spam" or "junk mail". 7.2 You acknowledge that Halal Market reserves the right to monitor any and all communications made to us or using our System. 9.1 Halal Market makes no warranty or representation that the Web Site will meet your requirements, that it will be of satisfactory quality, that it will be fit for a particular purpose, that it will not infringe the rights of third parties, that it will be compatible with all systems, or that it will be secure. 9.2 Whilst every reasonable endeavour has been made to ensure that all information provided on this Web Site will be accurate and up to date, Halal Market makes no warranty or representation that this is the case. We make no guarantee of any specific results from the use of our services. 9.4 The information on this Web Site is not designed with commercial purposes in mind. Commercial use of the Content of this Web Site is forbidden under Clause 2.2.1 of these Terms and Conditions. Any such use constitutes a breach of these Terms and Conditions and Halal Market makes no representation or warranty that this Content is suitable for use in commercial situations or that it constitutes accurate data and / or advice on which business decisions can be based. 9.5 Whilst every effort has been made to ensure that all descriptions of services available from Halal Market correspond to the actual services available, Halal Market is not responsible for any variations from these descriptions. 10. Availability of the Web Site The Service is provided "as is" and on an “as available” basis. We give no warranty that the Service will be free of defects and / or faults. To the maximum extent permitted by the law we provide no warranties (express or implied) of fitness for a particular purpose, accuracy of information, compatibility and satisfactory quality. Halal Market accepts no liability for any disruption or non-availability of the Web Site resulting from external causes including, but not limited to, ISP equipment failure, host equipment failure, communications network failure, power failure, natural events, acts of war or legal restrictions and censorship. 11.1 To the maximum extent permitted by law, Halal Market accepts no liability for any direct or indirect loss or damage, foreseeable or otherwise, including any indirect, consequential, special or exemplary damages arising from the use of the Web Site or any information contained therein. Users should be aware that they use the Web Site and its content at their own risk. 11.2 Nothing in these terms and conditions excludes or restricts Halal Market’s liability for death or personal injury resulting from any negligence or fraud on the part of Halal Market. 12. Law and Jurisdiction These terms and conditions and the relationship between you and Halal Market shall be governed by and construed in accordance with the Law of England and Wales and Halal Market and you agree to submit to the exclusive jurisdiction of the Courts of England and Wales. BACKGROUND: This Policy applies as between you, the User of this Website and Halal Market, the owner and provider of this Website. This Policy applies to our use of any and all Data collected by us in relation to your use of the Website. "Website" means the website that you are currently using halalmarketfoods.com and any sub-domains of this site (e.g. subdomain.halalmarketfoods.com) unless expressly excluded by their own terms and conditions. This Policy applies only to the actions of Halal Market and Users with respect to this Website. It does not extend to any websites that can be accessed from this Website including, but not limited to, any links we may provide to social media websites. 4.1 Any personal Data you submit will be retained by Halal Market for 1 year. 5.1 Halal Market may, from time to time, employ the services of other parties for dealing with matters that may include, but are not limited to, payment processing, delivery of purchased items, search engine facilities, advertising and marketing. The providers of such services have access to certain personal Data provided by Users of this Website. 5.2 Any Data used by such parties is used only to the extent required by them to perform the services that Halal Market requests. Any use for other purposes is strictly prohibited. Furthermore, any Data that is processed by third parties shall be processed within the terms of this Policy and in accordance with the Data Protection Act 1998. 7.1 Halal Market may, from time to time, expand or reduce our business and this may involve the sale and/or the transfer of control of all or part of Halal Market. Data provided by Users will, where it is relevant to any part of our business so transferred, be transferred along with that part and the new owner or newly controlling party will, under the terms of this Policy, be permitted to use the Data for the purposes for which it was originally supplied to us. 7.2 In the event that any Data submitted by Users is to be transferred in such a manner, you will be contacted in advance and informed of the changes. You have the right to ask for a copy of any of your personal Data held by Halal Market (where such data is held) on payment of a small fee. 11.1 Data security is of great importance to Halal Market and to protect your Data we have put in place suitable physical, electronic and managerial procedures to safeguard and secure Data collected via this Website. 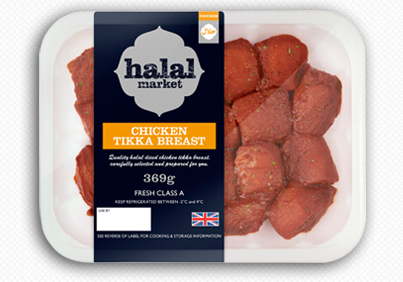 Halal Market reserves the right to change this Policy as we may deem necessary from time to time or as may be required by law. Any changes will be immediately posted on the Website and you are deemed to have accepted the terms of the Policy on your first use of the Website following the alterations.